Written by the author who brought us such bestsellers as the dictionary, Rasselas is a somewhat fantstical adventure story. Something I didn’t expect. This is my first time reading Dr. Johnson and for some reasons I was expecting something on the dry side and overtly theological. Amazing what false notions we can harbor out of ignorance. Rasselas is a Prince whose father keeps him and the rest of his family in an Eden-like magical kingdom that is cut off from the rest of the world. Nothing bad ever happens there. Everything is always hunky-dorey. But do you remember the episode of The Simpsons when Bart vexes his Sunday School teacher by wondering if one gets used to the fire and pain inflicted in hell? Well, I had a similar, but opposite thought about Rasselas. Doesn’t one get bored with everything being perfect? Apparently so, since Rasselas and his sister make a run for it after tunneling their way out of Eden with the help of a philospher friend. What they find on the outside are all the vagaries and vices of the real world. Not surprisingly, their years away make them long for the perfection of Abyssinia. Obviously lots of morals in this story. And I can tell you why they didn’t have such a good time on the outside, because they were goody two shoes who never let themselves go and actually participate in the vice around them. I guess that is what happens when you unleash a staid, moralistic Englishman (Dr. Johnson) on the messy wide world. Nothing. Just lots of repression and the imposition of cookie-cutter moral uprightitude on the rest of the world. The Verdict: I enjoyed reading this adventure tale, but upon reflection I think it could have been more interesting if Rasselas had gotten his…um…hands a little dirty. Mel: I didn't mean to besmirch Dr. Johnson by any means. I've never read it, but isn't this what Helen Burns was reading in Jane Eyre? I think that's what always put me off it! I agree with Mel on all points. Johnson was deeply religious but also got his hands dirty, throughout his life. I spent several months last winter reading books by Johnson and Boswell and came away with profound respect for both men, albeit for very different reasons. 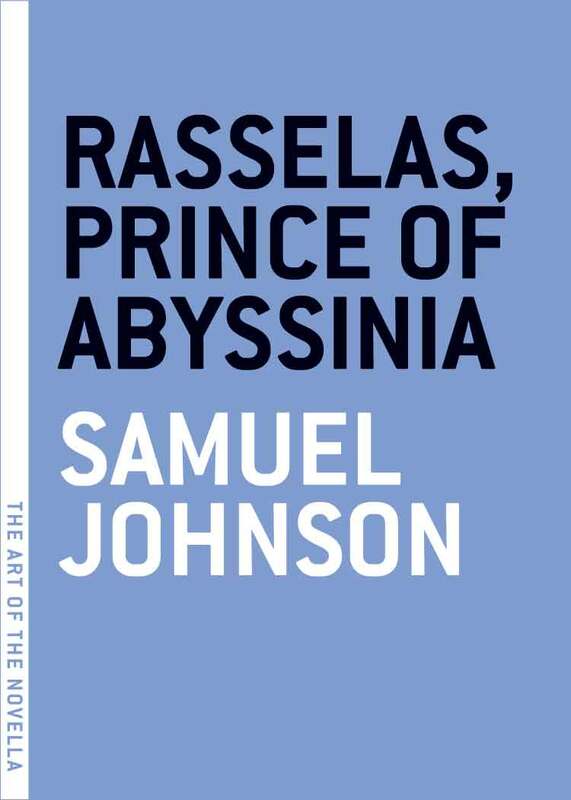 I interpreted “Rasselas” to mean that Johnson concluded, after much personal experience, that worldly pleasures were ultimately unsatisfying. He was anything but staid, by the way. As an aside – Roger Rosenblatt's first novel “Lapham Rising” contains much Johnson-worship. Loved it, except the very ending felt a little flat. Thomas-I know you meant no disrespect to Johnson-his portraits do give him a very severe look! Yes, during the Savage years Johnson sat in taverns and talked with prostitutes about how they ended up becoming prostitutes. I wish he'd written a novel about that! He did write some pieces of journalism on the subject, though, hidden behind pseudonym initials. They are full of humanity. I live with a cat named Hodge. Just written a review of Rasselas for my own blog. I like it very much, but am a bit of a Johnson fan also (and we tend to be rather, um, enthusiastic). Just a not to Sarahsbrooks if she ever reads this, Johnson did write a little about prostitution, for starters try The Rambler, episodes 170 and 171.